Giornale di Sicilia is an Italian daily national newspaper for the island of Sicily. It is based in Palermo, and is the best-selling newspaper in Sicily. Since 2017, it is owned by the daily newspaper of Messina, Gazzetta del Sud. Giornale di Sicilia was founded in 1860, immediately following the Expedition of the Thousand headed by Giuseppe Garibaldi; it was first published on 7 June of that year under the name "Giornale Officiale di Sicilia" with Girolamo Ardizzone as its first editor-in-chief. The paper played a significant role in nationalizing the Italian rural women in Sicily at the beginning of the 1900s. It is published in ten different local versions, one for each province of Sicily plus another one for the city of Palermo. Giornale di Sicilia had a circulation of 67,216 copies in 2004. The circulation of the paper was 67,332 copies in 2008. ^ Chris Peters; M. J. Broersma (2013). Rethinking Journalism: Trust and Participation in a Transformed News Landscape. Routledge. p. 50. ISBN 978-0-415-69701-9. Retrieved 25 November 2014. 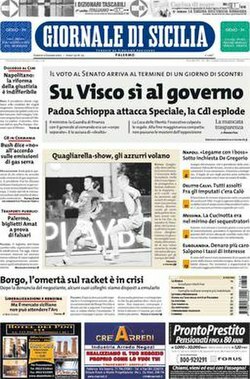 ^ "Fusione fra Giornale di Sicilia e Gazzetta del Sud, il controllo all'editore messinese". Repubblica. Retrieved 2017-08-04. ^ Linda Reeder (2003). Widows in White: Migration and the Transformation of Rural Italian Women, Sicily, 1880-1920. University of Toronto Press. p. 216. ISBN 978-0-8020-8525-2. Retrieved 25 November 2014. This page was last edited on 1 January 2019, at 17:13 (UTC).